Living in Japan Part 5: Furnishing Your Japanese Apartment | What can I do with a B.A. in Japanese Studies? In the previous two articles about living in Japan, I detailed the process of finding and selecting apartments in Japan. But one of the most expensive parts of moving into a new apartment is getting all the new furniture and appliances that comes with a new life. It’s simply not feasible to take all your belongings with you, furniture especially. This is part of the reason many people chose to search for furnished apartments or live in international dorms hosted by the university that are already furnished. So what to do if you start from scratch? In this article I’ll talk a bit about the benefits of different options, what you’ll need to think about to go about them, and some stores that will be helpful for you. Also which items are best bought where. As I mentioned in my first article on living in Japan, I am by no means an expert, these are only my experiences, and I welcome you to add your own so that the article can be more informative! Buy things used in stores. Buy things new online or in stores. Buy things used off of sites like Craigslist or Gaijinpot. Usually you can find one or two in your immediate area no matter where you are. If you go to their main websites in Japanese and search for the phrase店舗 (tenpo – shop) they’ll often have a search function by area that will lead you to maps of local sites near you. Some shops dominate more in certain areas than others—my particular ward has a lot of Cando shops but no Daiso, for example. So find out what the nearest and best one is for you. Still not sure? Try this handy website that allows you to put in any area of Japan and find out what the nearest 100 yen shops are to you! While in America we’re usually happy to run to a consignment shop or Salvation Army for used goods, trolling for cheap treasures, I wasn’t quite sure where to begin such a quest in Japan. There are a couple of good in-person options (as opposed to the internet). 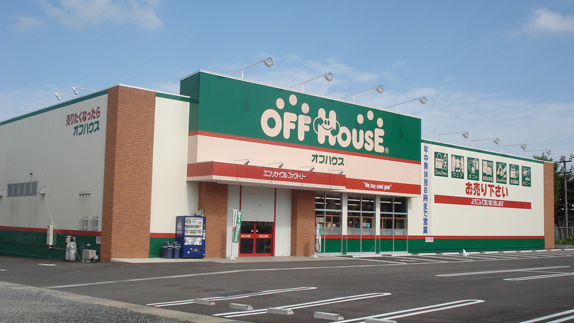 Off-house is a branch of the Hard-off franchise, which many people will recognize for its cheap electronics and appliances. Off-house deals in many different types of goods, including clothing, appliances, and in some cases furniture, but you want to be careful about checking the website of your local store to find out what it is that they carry. On their website there is an information section for each store. Once you find one near you by the going to the お店を探す” (search for a store) and inputting your area, they’ll include handy images that describe the merchandise they carry. If you’re looking for large furniture such as sofas or dining tables, this is especially useful, because not every Off-house will carry these. I’m not sure about the delivery options available for Off-house, because my local Off-house did not carry furniture (and thus I never personally visited it), but it’s probably safe to assume that if they sell large furniture some kind of option will be available (most likely for a fee) to delivery furniture to you. Since it’s second-hand, everything they carry will be different by store. So this is definitely a search and discovery type of situation if you’ve got a free afternoon and do your research on the contents of the shop. Consignment shops in Japan are known as “recycle shops” (リサイケルショップ) or “recycle centers” (リサイケルセンター) and may also have separate names they go by (one of my local shops is called 富士中, for example). The best way to find these types of places is to either ask someone you know or to google for recycle shops in your area by ward (区) name. Anything else (which I’ll talk about in the next section) can probably be bought new for roughly the same amount as a recycle shop will sell it to you, although again, it depends on the shop and if you care whether something is an old model or not. I was able to get a refrigerator, washing machine, two-burner stovetop, and standing fan for ¥36,000 (about $360) total at my local recycle shop. Usually they’ll have a small truck that they may offer to bring you your stuff in, especially if you’re local. While I could have gotten my burners and fan for roughly the same price new elsewhere, the convenience of going to a neighborhood recycle shop down the street and having my items delivered for free to my door a couple hours later was what I was paying for. This will really matter for some people. Ikea was forever a fabled, epic place for me, as I had never been—even in the States—and had only heard stories from friends about its treasure troves of furniture and knick-knacks (and, for some reason, food?). The Japanese Ikea lived up to the general Ikea reputation as a vortex of home goods to be found for relatively cheap. As with most places selling you relatively larger furniture, they will ship it to your home. The downside is that these fees are usually fairly high, and vary by the number of items and their weight. While it’s nice that you can get a dining room table for only ¥4,000 ($40), you may end up paying ¥6,000 ($60) for delivery anyway, meaning you didn’t save as much as you thought. Delivery costs go up based on the area you want your items delivered to, the number of items you’re having delivered, and the total weight of the items. Also, certain items, such as rugs, dishes, futons, etc., are not capable of being delivered, so if you plan on going to Ikea for a large shopping day to furnish a good portion of your apartment, you should bring a lot of friends or plan on carrying a lot home yourself. delivery costs can be high – you can check approximate delivery costs here. things you want that you see online may not be in stock at your local store – in order to check this, you have to put things you want on your shopping list on the Japanese website, then review your list and check for availability at your local store. I’m glad I did this, because when I wanted a dining room table and chairs, all the Ikeas in my area were completely out of the cheapest chairs and I had to rethink my strategy. Nitori is Japanese home furnishing and interior design store that also sells relatively cheap goods, including furniture, bedding, shelving, appliances, etc. It’s great if there’s a Nitori nearby you that’s easy to get to, but in my case I felt it was easiest to just look things up online on their website. After a harrowing day at Ikea trying to figure out if I should go ahead and buy a western bed on the cheap, a friend directed me to Nitori and informed me that fairly reasonable and comfy futons could be bought for much less money there. This is particular important because getting rid of furniture in Japan can be a huge pain, given the regulations on oversized trash and/or transporting goods to new owners. At Nitori, I was able to buy a three-piece (shiki-futon, kake-futon, pillow) set in semi-double size for about ¥10,000 ($100), whereas the cheapest bed at Ikea ran for about $150 and seemed somewhat unstable, and would have also had a delivery free. Delivery from Nitori was free. If you want to go the futon route, I would highly suggest just ordering online from Nitori, as it also makes it easier to have all your futon measurements readily available to order your covers and sheets online too and get them all in one big package to your door. Takeya is an extremely well-known and old department store in Tokyo. It is a discount basically everything store, but in searching for large furniture like a dining table, I found the best and cheapest things to purchase there are smaller furnishings, such as rolling carts for the kitchen or cushions for your chairs. I won’t dwell on the details, because it seems to be an only-Tokyo thing and the website is in English, but it’s definitely somewhere to check out. The rolling cart I got there was about $7 cheaper for the exact model as I found on Amazon.com. They also do home delivery, but likely for a small fee. They also have an online website for shopping. If you can find the equivalent of Takeya in your area, I suggest looking for some of the smaller furnishings there. I also bought my small cheap iron and ironing board at Bic Camera, and have no regrets. They will do home delivery for items for you generally for free, although they will charge you if you ask them to set things up/install them (設置) for you. With most small appliances this won’t be necessary, but definitely will be if you don’t know how to set up your gas burner. Rakuten is another well-known site where you can buy items fairly cheap on auction, with the major benefit being the number of offerings and the fact that you can do cash on delivery for items delivered to you (very helpful for those of us who don’t want to use our foreign credit cards). Usually the items listed will tell you if they’re free delivery (送料無料). I haven’t used rakuten personally yet, but I have many friends who swear by it. Amazon, as in America, is a great place to buy things on the cheap and not have to worry about major delivery fees to get them to your house. In fact, sometimes they’ll list that delivery is free for a specific area (usually Kantō). While you can get almost anything on Amazon without ever leaving your apartment and have the benefit of getting measurements listed online, sometimes it can be difficult to find the things you want by name. 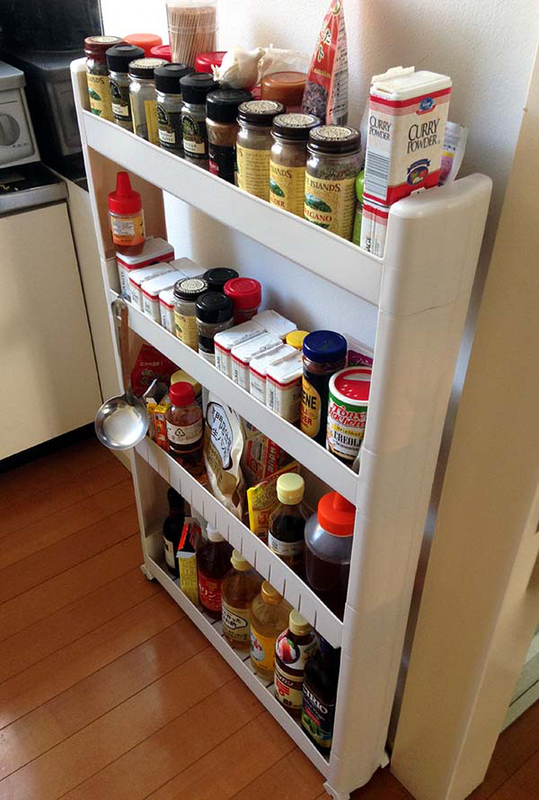 This spice rack is amazing and actually meant to slide into the gap between your counter and your fridge! You may have to navigate a number of these to find exactly what you need, but I was able to find some ridiculously specific things (like my AMAZING rolly spice rack on the right, thin enough to hug the wall of a tiny kitchen) that I couldn’t find no matter how hard I tried at Ikea or Takeya. Also on Amazon I was able to find the dining room table and chairs I was looking for (more on that below). Delivery can sometimes be free, depending on the seller. And, depending on what you’re buying, you may have one or more options to pay that could include credit card, cash on delivery, or bank transfer. This can be helpful for those of us that don’t want fees for cash conversion on our foreign credit cards. While we might run to a Home Depot, Walmart, or Kmart for some of our department-store type needs in America, it’s sometimes less clear where you can find these things in Japan. 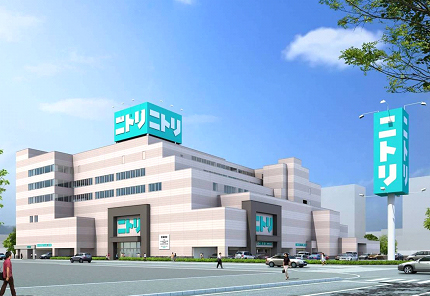 Department stores are often called “home centers” (ホームセンター) and go by other names. For example, my local home center is called “Olympic.” You can probably find out what local home centers in your area are called by googling your ward name andホームセンター. Some well-known department stores to foreigners are those like Don Quixoteドン・キホーテ, which can also feature grocery stores in them as well, and Aeon Mall. Although much of what you might be looking for could be found in 100 yen stores, sometimes department stores are a much better choice and almost always have a larger selection. Some basic electronics and appliances can be found here for roughly the same price as Yodoyabashi Camera and Bic Camera, and you’ll also typically find goods like shampoo, cleaning supplies, etc. in addition to the standard tools, gardening supplies, some bedding, small sized furniture, etc. My local home center has a good selection of storage items like shelves and racks, but it tends to be a little more expensive than Ikea or Amazon, although some items, like a standing mirror I bought, were the same price as such stores. Delivery depends on the store. I suggest you investigate local prices against larger places, because in some cases you might wish to pay more at a home center for the convenience of just being able to walk whatever you bought home in your own neighborhood. Some of the items I couldn’t find readily elsewhere that I’ve gotten here include trash cans, netting to fight off the bugs, and insulation options for my freezing cold apartment. Buying things used off of sites like Craigslist or Gaijinpot. Those of us who want to get bargains on everything by getting it used off the internet are likely to first turn to sites like Craigslist or Gaijinpot for the well-known “Sayonara Sale.” The cost of disposing of large and small furniture and electronics can be a big hassle in Japan, so there is no shortage of foreigners who, upon ending their time in Japan, want to get rid of it as quickly as possible to someone else who wants it. If you’re in an area with a JET community and can connect with the JETs, lots of them have Sayonara sales in June-July. They usually post on Facebook, so if you have an in, use it. For small items, this can be great, because most people are willing to meet you at a particular station and you can get some really great cheap (or sometimes free) items from people desperate to dispose of their goods. For larger items, this becomes a bit complicated, because as a foreigner in Japan, you aren’t likely to have your own car right away or perhaps at all, and it’s frowned upon to bring large furnishings on the train systems. In my case, I hunted for a couple of weeks for the best deal on a dining room table and chairs. Most people told me to go to Ikea, where, looking at the website, I found I could get their cheapest table for 4 people for around ¥4,000 ($40) and their cheapest chairs for $2,500 each ($25). However, when I investigated the cost of shipping, it was an estimated $6,000 ($60). This meant that I would end up paying about $200 for my table and chairs. Being a cheapo graduate student, I wanted a better deal than that. And, having looked up availability, I found that neither of the Ikeas near me even had the chairs I wanted in stock. Nuts to that! I then decided to look around at local furniture locations (like Takeya, another local furniture shop, Asami kagu) but found that everything was fairly expensive. I followed the furniture section of Craigslist closely for a couple weeks, hoping for a Sayonara sale to pop up that would be to my benefit. I discovered a table (a little longer than I wanted) and two chairs for sale for ¥8,000, and another set of table and four chairs for ¥5,000, but then remembered: these have to get from point A to point B. For large furniture off of Craigslist or Gaijinpot, you’ll have to consider the possibility of hiring a moving service. Most places I found that spoke English (because I was feeling lazy) charged around ¥6,000 – ¥9,000. This meant, of course, that much like Ikea, I was going to be paying roughly the same price for the items themselves and delivery, in the $175-200 range. In the end, I got tired of not having a place to eat properly or set up my laptop, got irritated by the idea of having to take the train out to Ikea or coordinate two-ways over the phone delivery to a strange location, and paid roughly $200 for a dining set on Amazon that could be delivered (free) to my apartment. Convenience won out over patience in this case, BUT I have known many friends who have secured large furniture for free or near free and utilized moving services, saving a lot of money. Stand in each room and make a definitive list of what you want. This will help you figure out which stores you really need to go to. 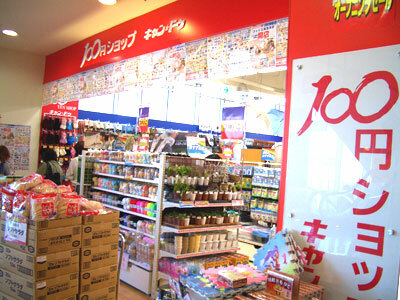 Hit the 100 yen shops first, then move up the ranks. Ask around about the names of shops in your area. I would not have known about some of the local furniture shops that were not big-name stores if I hadn’t. I also would never have found out where the local department stores were, since I had never heard of them and could not have guessed their names. Check availability online, if you can, at stores like Ikea or Off-house. They may not carry the specific goods you’re looking for and a wasted trip in your first jetlagged much is a huge drag. Always take into account how much you want to spend + whether or not delivery fees will increase how much you’re paying for what you want. Take measurements of every potential space in your apartment for the things you want. Some spaces in your apartment may be odd or teeny tiny, and the last thing you want is to be standing in an Ikea or Nitori wondering if the space you have for the cart you want is more or less than 20 cm in width. Take measuring tape with you when you go out shopping. That’s it for now, but if you have anything else you want to add about places or methods you’ve found particularly useful for furnishing your apartment or house in Japan, please feel free to leave a comment below and add to the greater knowledge! This entry was posted in graduate school, housing, living abroad, main posts, study abroad, undergraduate, useful links and tagged furnishings, furniture, housing, Japan, living in Japan, saving money, stores. Bookmark the permalink. Pingback: End of Year Cleaning and Suggestions | What can I do with a B.A. in Japanese Studies? I’m looking to get a place in Fukuoka, Hakata-ku or near by for school in April. I just learned that Go Go Nihon has left me to my own device, and basically threw me to the wind. My main thing is Furnishings, and do any of these places actually have it delivered before we arrive for school? I’ve slept on floors before waiting for a bed to arrive… but it was carpeted… hardwood doesn’t seem like a good idea to be sleeping on for a week or two you know. This is my big concern right now! I’m afraid I don’t have any personal experience with the furniture rental, and most of the people I know had other accommodations before they made their move and put those plans in motion… I can try to ask around and see, but you might be better off asking the companies directly. I think you can schedule specific days for delivery with most places. My wife and I have been researching quiet a bit as of the last 12 hours, trying to figure this out. If you do come across anything you feel would be helpful, we would be mighty grateful for any help!